SALEM, OR – A NEXO STM line array system and Yamaha CL5 Digital Audio Console with two Rio stage boxes were provided by audio production company Alpha Sound for Salem World Beat Festival. Riverfront Park was the location of the 21st Salem (Oregon) World Beat Festival where visitors were able to experience the music, dance, food, and traditions of over 70 nations. Ten stages showcased everything from West African culture and dance workshops to Native American powwow and Irish dancers. 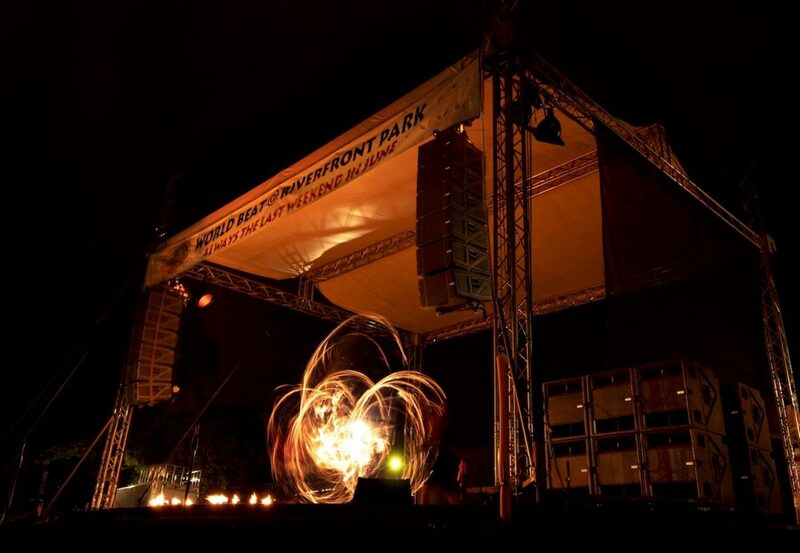 On the main stage, attendees were treated to headlining performances by artists such as Radio Jarocho and Edna Vazquez culminating with the famous Pyrite fire performances after sunset. Local audio production company Alpha Sound provided a NEXO STM line array system and Yamaha CL5 Digital Audio Console with two Rio stage boxes for the two-day event. The main stage system consisted of 12 STM M46 line array boxes (6 per side), 12 S118 subwoofers (cardioid – 6 front, 6 rear), 2 PS15R2 speakers for extended L/R, 4 PS10 surround L/R speakers (2 per channel), and 5 NX4x4 amplifiers to power the system. Yamaha Rio-3208 and Rio-1608 input/output boxes accompanied the Yamaha CL5 at front of house. For more information on Alpha Sound, follow them on Facebook at Alpha Sound of Oregon or on the web at www.alphasound.org.